I had a dream last night that after 42 years of marriage, my mom divorced my dad and got a new boyfriend. She also got a bob haircut. This might have been caused by my conversation earlier in the evening with an old friend who is going through a divorce. The dream took place at some sort of orientation for the first day of my final year of college. My mom showed up with this guy and my brother (though my bro was much younger, maybe we all were). There were no classes to go to, but I was to choose my living quarters for the year. It consisted of a spot in a huge room, sort of like a gymnasium, but slightly homier, with nice hard wood flooring and newly painted walls with wood trim reminiscent of wainscoting. I found my spot, against one wall at the far corer of the room, and put down my blanket. I put a couple of my belongings on top, a pair of combat boots (which I don't own in real life) and some flowers, to mark it as mine. My mom walked off ahead, down a hall to an outdoor walkway, hand in hand with this random man, and eventually I gave up and followed. I didn't know what this strange man was doing there, but what can you do, you just keep going. I wondered where my dad was, and hoped he had gone to live with his brother in their mother's old house. Maybe they would at least enjoy each others lonely company. I just read this in a news story in the SF Chron. "Statements by public figures are being watched more closely in the post-Don Imus era." Welcome to the future... oops, too late! It's already over. Last August I signed up for some classes at Studio A.C.T. A voice building class and an acting class. It had been years since I had done any formal work in either. The acting class was the usual, we partnered up and did scenes. My first scene partner nearly abandoned me, my second was a lovely woman who, while she didn't have tons of acting experience, was a lot of fun to work with. My third partner was kind of a rookie. That was ok too, if a little frustrating. He was always prepared to work though so I couldn't complain. The voice building class was just a big room full of people, all singing along with the exercises the teacher gave us. When the next session came up I decided to stick with the singing. It was just more fun and didn't require any meeting up with a partner during my busy week. I tried to get into an ensemble class, but it was cancelled. The director of the school suggested the master class instead. We determined I'd had enough prior experience with music. It was a frustrating class at first, I didn't hit stride until 1/2 or 3/4 the way through the 10 weeks. Finally, I made some improvements and it got more fun again. I decided to sign up for the class again this session. A couple of weeks ago I started to notice some real changes in my voice. Louder, sure, but also just better and easier. My range is much larger, and I've got a lower chest range I never had before. Now the teacher has assigned me some pretty difficult songs. It's a challenge, and I love it. The next class is an audition class, and I think I'll give it a try. If I start auditioning, I'll definitely need a different job, I think. Anyone got any ideas? On Friday I recorded another 80s cover with jsd and he could definitely tell that something different was going on. I'll post it when I've got it. Sonia blog tagged me, apparently she was tagged by Arline, who was tagged by Sunshine. To play, you have to write in your blog 10 random things about yourself, facts or habits. Next you tag ten people, and say you tagged them. You leave a comment saying “tag you're it” and send them to your blog to explain, (but you can't tag someone who tagged you). I've been tagged before, and ignored it. Only in the past it was an email game with an ever increasing number of recipients in the to and cc lines. My brother has been tagged, all my pals have been tagged, so there's no one left for me to tag. In the spirit of halfassed halfassedness, I will at least make a list of 10 things about myself. 1. I'm 5' 6" but a lot of people think I'm taller. 2. I like bad beer, lately my favorites are high life and pbr, but I still like a bud once in a while. 3. I've lived in the same apartment for 11 years (and my rent is less than yours). 5. I've been studying the Garcia-Marchesi singing technique and have increased my range and volume substantially in the last 6 months. 9. I have a friend who I have known since I was born. 10. I like watching terrible movies. I've gone all crazy for whole grains. Mostly moved over from the refined grain products. I still eat white flour and white rice and all that good stuff, but have been trying to widen the variety of whole grains in my diet and try to use them pretty exclusively when cooking at home. It's the latest craze and I'm on the bandwagon with a tambourine. Brown rice was already a regular in my food, but a while back I added quinoa. Lately, I got millet and barley into the mix. Talking to some friends the other week I thought I might try sprouted grains. I screwed up the first batch, it was probably about to turn into beer, but today a nice mix of oat, barley, wheat, and rye finally started showing their sprouts. Tonight I threw a big handful into a pile of other stuff and ate it up. It was pretty good. I feel all healthy eating this crap, and luckily it tastes good. Best is that the stubborn zits that would never leave no matter what I tried have cleared up. They only came back this week after I spent last weekend eating birthday cake and crackers. Hmm. Perhaps whole foods will help me live 4-evar. 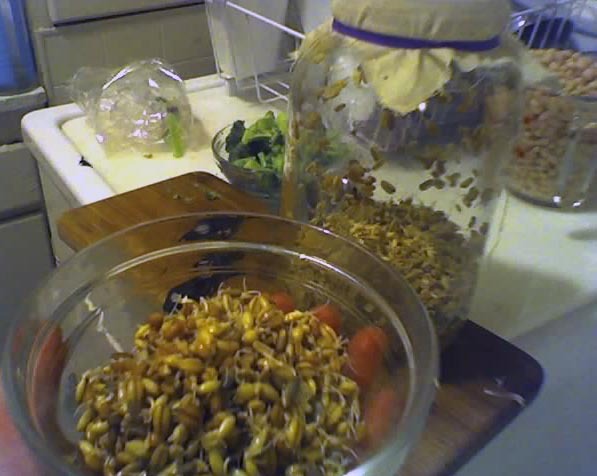 Here you see the jar I used to sprout them in (soak them overnight, then rinse a few times a day, tilt downward to drain) and a bowl full of the grains with their sprouts showing.